China’s state authorities appointed their third unofficial bishop in eight months – escalating tensions with the Holy See. 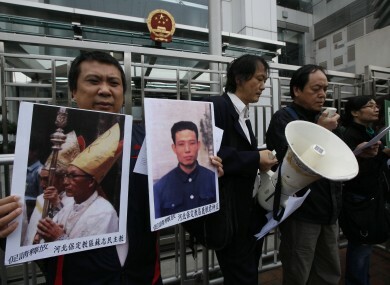 Catholics from Hong Kong protest against China's plans to appoint a bishop without Vatican approval in December. Yesterday's excommunication is the third in eight months. THE VATICAN HAS excommunicated a Chinese priest after he was forcibly ordained a Bishop by the country’s state-controlled Church. Joseph Bingzhang was ordained as bishop of the Shantou diocese on Thursday, but the Vatican yesterday said Bingzhang had been expelled from the Church over his unauthorised apppointment. “The Holy See does not recognise him… and he lacks the authority to govern the Catholic community of the diocese,” the Holy See statement said. The statement was almost identical to that issued last week in connection with another unauthorised Chinese ‘appointment’, Lei Shiyin, who had been ‘ordained’ at the end of June. Another bishop was excommunicated after being appointed by the State in November. While the Vatican says it has the sole responsibility of appointing Church officers, the Chinese government considers the Vatican to be an outside administration and appoints its own individuals to Church offices. Asia News had reported that Chinese Catholics were anxious about the proposed appointment before it took place, having expected an excommunication to follow just as it had done in Lei’s case. Its report added that the Chinese Patriotic Catholic Association’s election to appoint Bingzhang was rigged – and that the diocese already had a Vatican-sanctioned bishop appointed in 2006. 44-year-old Bingzhang, who has political links, had been urged not to put his name forward for the election. The Vatican’s statement said the Pope “deplored” how the Chinese Church was being treated. It has long been suspected that the CPCA was deliberately seeking to force a schism in Chinese Catholicism by forcing members to abide either by the rule of Rome or by the CPCA – neither of which acknowledges the other. Email “Vatican expels 'bishop' unofficially ordained by Chinese government”. Feedback on “Vatican expels 'bishop' unofficially ordained by Chinese government”.